The observant eyes will notice a new feature on our Blogs - this is a Syndication Service and allows you to subscribe to this Blog page and for you to automatically receive email updates when any new posts are put up. Your email client needs to be html-compliant (in Groupwise use the HTML view) so it will look quite similar to the original webpage complete with graphics! You simply type your email address in the dialogue box and press the Subscribe me! button. PLEASE DO NOT MAKE A MISTAKE WHEN ENTERING YOUR EMAIL SINCE I HAVE NO AUTHORISATION TO CORRECT MISTAKES. A new screen will come up which will ask you to confirm your account details (see Image). 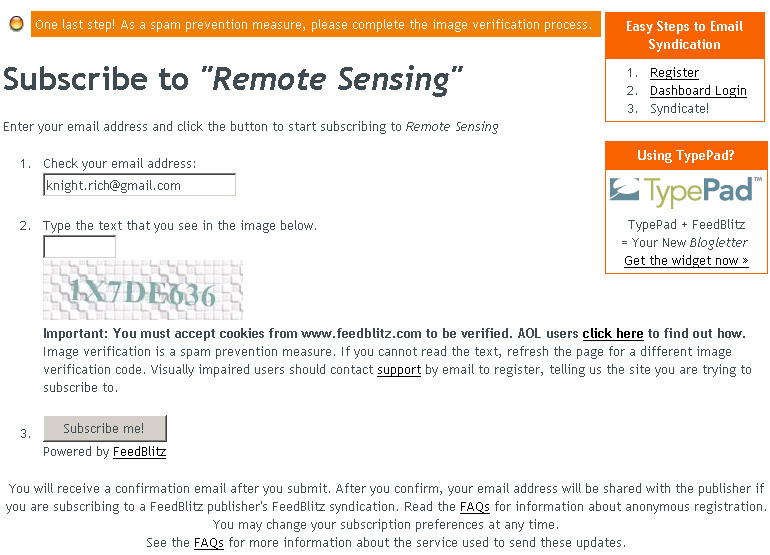 Confirm that your email is correct and then type in the code (an anti-spam procedure). 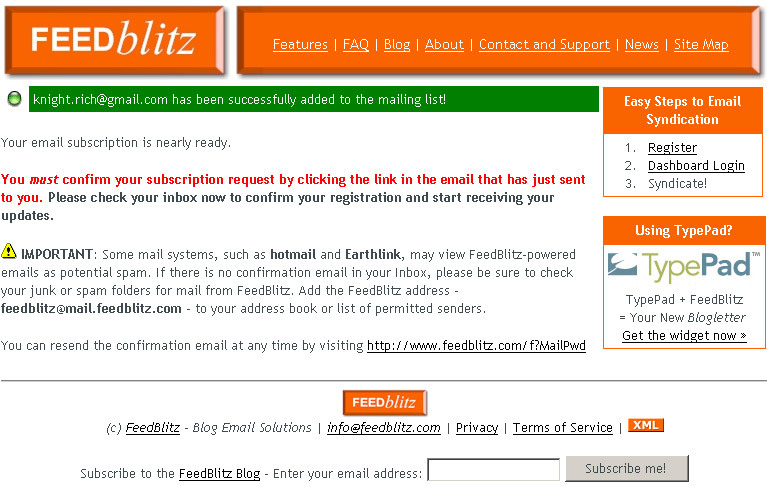 You will get an email from FeedBlitz with a link to confirm your acceptance of the subscription (another anti-spam procedure). From then on you will get notification when posts are put onto this particular Blog (or until you unsubscribe). You only receive an email when new postings are put up and also in an aggregated daily report (all postings for all of your subscribed Blogs are compiled as one report). Ensure that you use the html client when confirming your acceptance of the subscription notification and do not mark private. I will remove all subscribers who are anonymous. You only have to accept the subscription once, from then on it automatically searches and compiles new postings that are sent to your by way of your email account. Finally you will need to do this for each of your Blog pages (Scientific Methods, Biodiversity, Invasive Biology and Resource Mapping) since each is effectively a different website/address. When I invite you to new Blogs in the future please make sure that you subscribe to the Blog as well! 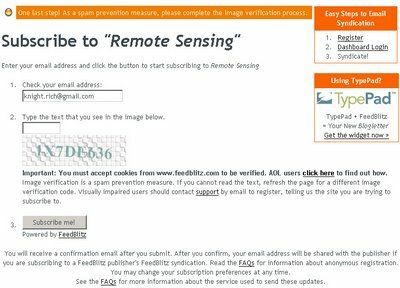 The type of Service is called RSS and is often referred to as the following... Really Simple Syndication. An RSS service delivers Blog/Website information as an XML file called an RSS feed, webfeed, RSS stream, or RSS channel. This allows Blog users such as yourselves to track updates on the various sites that they subscribe to using a news aggregator. Cheers and enjoy subscribing to our new information services. Wikipedia contributors. Aggregator [Internet]. Wikipedia, The Free Encyclopedia; 2006 Jun 21, 08:49 UTC [cited 2006 Jun 27]. Available from: http://en.wikipedia.org/w/index.php?title=Aggregator&oldid=59779980. 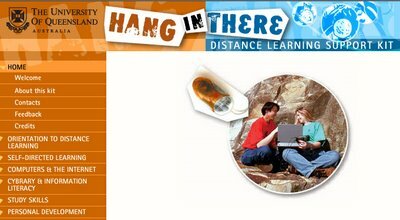 I have just received an e-mail on a great resource from the University of Queensland called "Hang In There" - Distance Learning Support Kit since you are all registered for a distance-based degree there should be some useful resources and hints. I really urge you to look through this site and please also look at the section on plagiarism - it is quite helpful. University of Queensland is one of the leading providers of distance education. Try the quiz Am I ready for distance study? Recognise that learning is a process that is ongoing and lifelong. Recognise that learning is an active construction (or building up) of knowledge and understanding, not just memorisation of facts. Actively connect new information with prior knowledge and previous experiences. Are aware that the learning process requires intention and effort. Take responsibility for their learning rather than expecting their teachers to do it for them. Understand their preferred learning styles. Understand how to self-manage their learning. Have a range of strategies they can apply to any learning situation - at work or in their lives generally. Think critically about what they are learning. Take time out to reflect on and monitor their learning. Are confident, independent and prepared to take risks. Aren't afraid to ask questions and seek help when they need it.